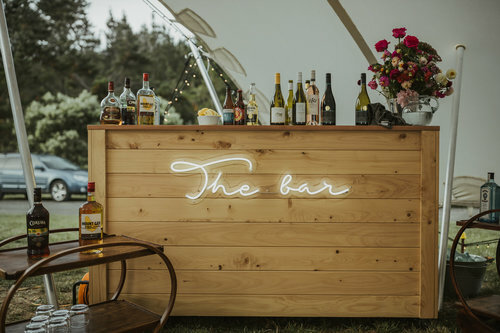 To make life just that little bit easier throughout the planning process, we've compiled a list of our favourite local event specialists. We work seamlessly with these talented experts, but we're also open to working with new faces. Wild&Whim are a wedding planning service that builds events around your personal style and goals. Wild&Whim consider every detail, every attendee, and every requirement of an event to create fun, vibrant, ground-breaking experiences. Sleek, modern, effortless furniture for hire. Louisiana Lucy want their furniture to be the bones of your speacial day, and pride themselves on providing not just a piece of beautiful furniture but an epic experience that you and your guests won't forget. Twelve Tables have clear marquees, tables, bench seats, and bar leaners waiting to make your day perfect. In summer, pull all the sides back and soak up the sun, or enjoy being dry and warm as you watch the rain fall on the roof. Tauranga's leading floral stylists, On My Hand are passionate about what they do and have the ability to turn the ordinary into exceptional. Each event is styled with sustainability and creativity in mind, to ensure your occasion is truly memorable. Flowerette select only the freshest flowers direct from the market and deliver beautifully styled bouquets for all occasions across Tauranga, Mount Maunganui, Papamoa and the Bay of Plenty. Whether it be a small posey for a friend or a grand scale installation, a love for flowers is at the heart of Wonder Florists’ work and they pride themselves on creating bespoke arrangements and designs of the highest quality.